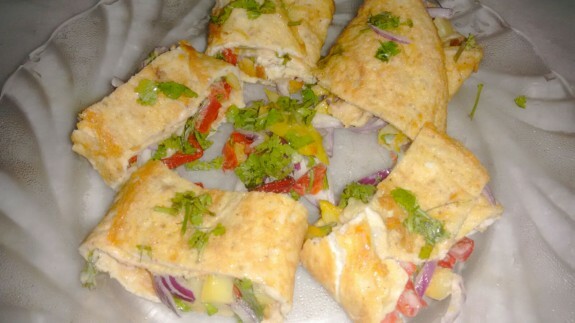 Spanish egg rolls are not traditional egg rolls but egg rolling with vegetables mix as pudding. This egg roll is delicious and also healthy to eat. We share this unique recipe with you so that you can easily make it in home. 1. Mix 2 tbsp of Mayonnaise and 2 tbsp of tomato sauce in a bowl and keep the mixed sauce aside. 2. Thin vertically chopped all the vegetables. 3. Now in a pan heat 2 tbsp oil and pour all the vegetables. Lightly fry them. Sprinkle salt, chaat masala and black pepper powder as required. 4. Stir and fry the vegetables for few minutes and remove it from heat. 5. Beaten 4-5 eggs in a bowl and sprinkle little salt on it. In another pan, heat 1 tbsp oil and pour the eggs part by part by 2 equal parts. 6. Fry one side very well and turn it and then fry another side. 7. After frying the both side, place it on a plate and coat one side evenly with the mixed sauce. Place some cooked vegetables into the egg and roll it. 8. Cut the roll in small pieces and serve it hot. 9. Do the same process with another part of the beaten egg. Your Spanish egg roll is ready to eat now. You can pinch a tooth pick on the cut roll pieces so that the egg roll pieces will not open.